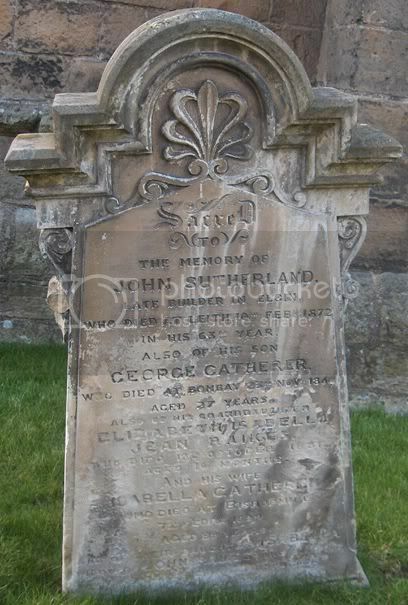 Sacred to the memory of John Sutherland, late Builder in Elgin who died at Leith 10th Feb 1872 in his 63rd year also of his son George Catherer who died at Bombay 23rd Nov 1866 aged 27 years. Also of his Grandaughter Elizabeth Isabella Jean Raikes who died 12th Oct 1881 age 16 months and his wife Isabella Catherer who died at Bishopmill 7th Feb 1894 aged 89 years. And of their daughter Isabella, widow of John Raikes, 50th Foot Regiment died 2nd July 1898.